Bring the most interesting part of the problem (to me) to the front of the task. The idea of requiring the seams to go in the same direction with a minimum number of seams is the only opening for multiple answers in this problem. Start with this, and the students will already have a chance to disagree about answers, which we know is a good way to get conversations going. Frame this possibility of multiple arrangements visually, not with text. By placing the carpet strips in different configurations when first displaying the task, I'm nudging students toward different answers. Again, this conflict is important to spicing up a pretty plain textbook task. Get rid of those mixed metric/English units immediately. There is no reason that a person would measure the room in meters and then deal with a store that sells in feet and yards. There's enough here to keep things interesting without dealing with meters and yards. Leave out unnecessary vocabulary like 'bolt' and 'seam'. One more move to reduce the text overload of the problem. Hand out slips of paper with either Situation A or Situation B shown below. Once students have drawn their lines, share a few of the drawings to show the differences. Pose the question: Which situation (A or B) will require more cutting? Have students make and record their guesses. Move to the second act here. What information would you need to answer the question precisely? 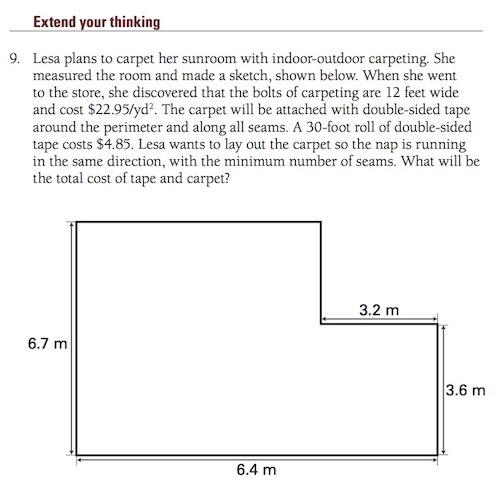 In reality though, students could figure this out just by making measurements with a ruler on the diagram. No big deal either way. 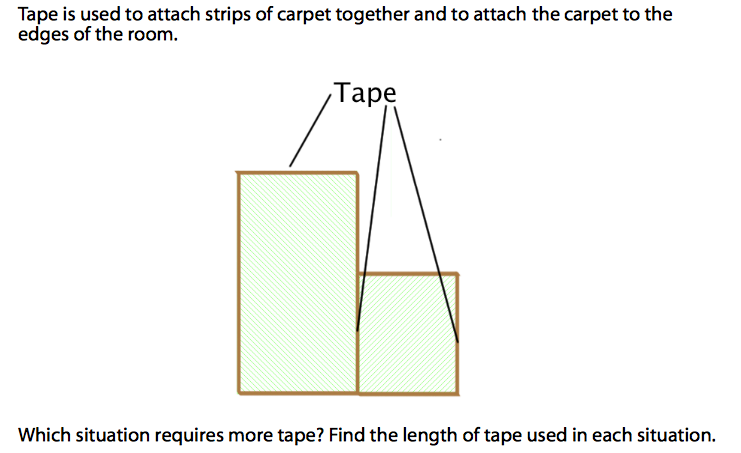 The students might not realize that the carpet is attached at the edges of the room (though not usually with tape) which is why it's important to bring up this point. 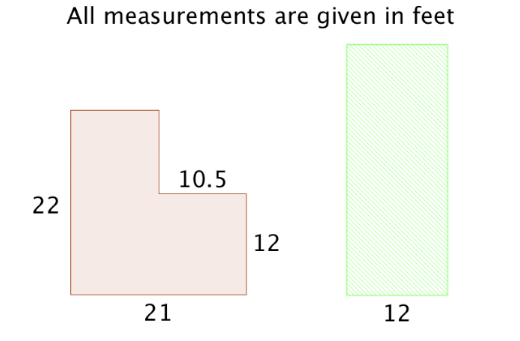 At this point the dimensions diagram still might be requested, but it isn't really necessary until students start reporting their answers. What units are involved? What is the minimum cost to carpet the room? Suppose you also make $11.50 per hour to lay carpet. Which situation do you choose to maximize the money you make on the job? What information would you need to answer this question? Having students work to answer this efficiently means getting students that have worked on the two situations to talk to each other. If you can cut the carpet at 2.5 inches/second for a straight cut, with an additional second for each cut, how long would it take for you to prep the carpet for the room? This is my first attempt in the Make over Monday series, and I'm exhausted. Also, this was fun. What's next, Dan?